« Day 111 – Katy S.
Day 112 – Juan E. and Alex C.
Katy’s decision to destroy the $10 seem’s to have sparked some interesting discussion. That’s good. 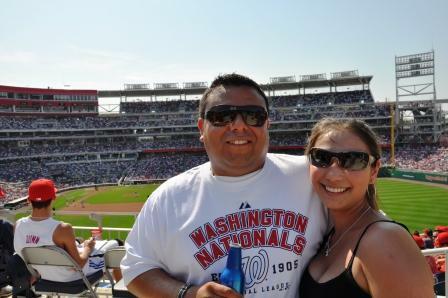 So last week I went to the opening day game of the Washington Nationals. I have went to the opening day game every year since I moved back to DC. I thought it would be fun to find someone at the game to give my $10 to. Well, I had a little trouble getting in the game at first…I thought that I would just pick up a ticket at the stadium, however, with Obama throwing out the first pitch and the Phillies in town, there were no tickets at the box office. I finally got a ticket after the 2nd inning. I was standing next to a couple in the outfield section. That’s right, I only got a standing room only ticket…couldn’t afford much better, but all I really cared about was being there and being part of it. Well, it’s also nice to win too! I was waiting until the innings changed to ask the couple if they would be a part of the Year of Giving. I didn’t want to disturb them while the game was being played. Well, the inning was going on forever. The Nationals were getting clobbered. They pulled pitcher John Lannan in the fourth inning, better than last year when he was pulled on opening day in the third inning. Clear sign of improvement. Anyway, by the time I got to asking the couple, the guy had went to get some hot dogs or something. So I asked the young lady who gave me a look like, “look buddy, don’t hit on me” and assured me that her boyfriend would be right back. Ok, so I waited, and waited, and waited, and finally Juan arrived with beverages in hand. I told him what I was doing and he said he was up for it. Juan is in the landscaping business and was taking the afternoon off. Juan’s father started the business shortly after the family moved to VA from El Salvador. He has since handed over the reigns of the company to his son Juan. Juan originally said he would use the money to buy some beers. However, a little later he said that he wanted to give me the $10 back if I would give it someone else still today. Well… I can certainly do that…in fact, I am pretty good at it. So, back to square one. I think in the future I might not accept the money back with any conditions. After all, I don’t put any conditions on those who I give to. There is some discussion on this from Day 8 when Kevin gave me the money back. Juan’s nice gesture to give the money back turned into the good fortune for a young guy from Havertown, PA. 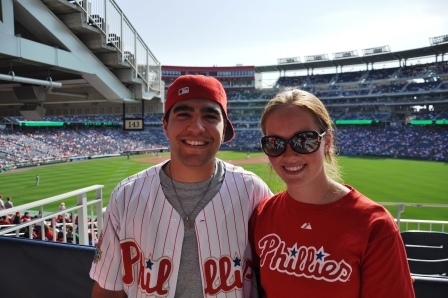 Yes, a Phillies fan. No surprise really, pretty much everyone at the game was a Phillies fan. Alex was down in DC visiting his friend Brynn who is a pre-med student at Catholic University. The 22-year-old fan said he skipped his job as a Project Administrator for a commercial pool company in order to come down and watch his team beat up on the Nationals. I didn’t want to bother Alex too much more since the game was in progress so I just asked him two final questions. I asked if he needed anything that I could help him with via the Lend a Hand section and he couldn’t think of anything right then. As for the destiny of the $10, Alex said it would go toward gas to get him back up to Pennsylvania. I noticed that people were flooding out of the stadium. While I was talking to Alex, the score somehow got to 11-1. And I thought last year was bad when we lost 12-6! Hey I read your story through the news and I just want to say I find it very intriguing what you are doing. I think it is a great thing and like you said even though 10 won’t change anyone’s life it is still a very nice gesture and I am very intrigued to see what people will spend the money onb$. I plan on giving 10$ on the day that you asked everyone to do it for one day. Keep it up ! !